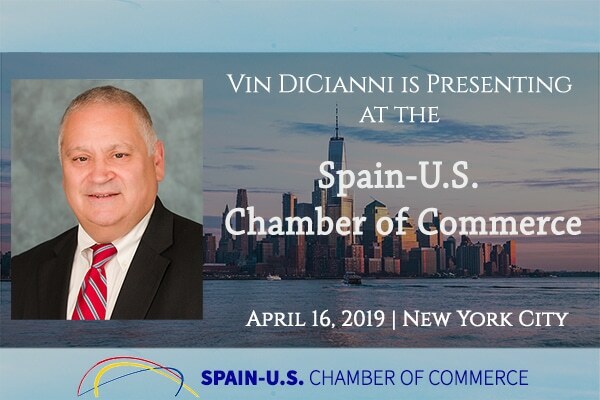 Vin DiCianni Archives - Affiliated Monitors Inc. 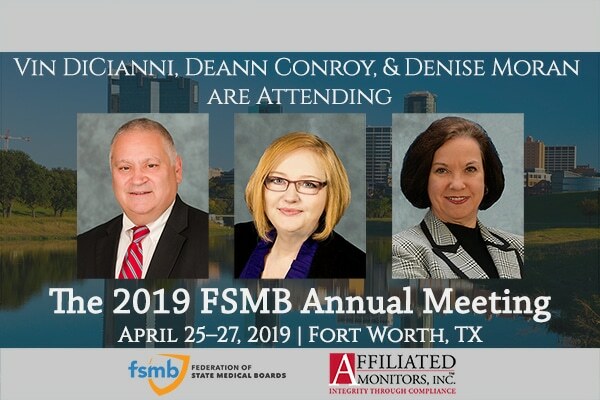 The FSMB Annual Meeting is the premiere educational and networking event for the nation’s medical regulatory community. The three-day event brings together health care leaders to discuss current challenges and innovative ideas that will help shape the future of medical regulation. This three-day intensive program brings together national experts in the field of medical licensure and discipline to discuss current and future challenges facing medical regulators. Compliance and Ethics programs and cultures are increasingly becoming a focus of investigators and prosecutors when looking at corruption, fraud, white collar and other behaviors. Strong Ethics and Compliance Programs and cultures are achievable with focus on the key areas of education, detection and internal remediation of corporate behaviors. Government regulators and health care attorneys are often faced with the challenge of finding an appropriate resolution of matters involving physicians and other providers subject to disciplinary action. One solution – independent monitoring – is being used with increasing frequency to resolve disciplinary or practice issues. 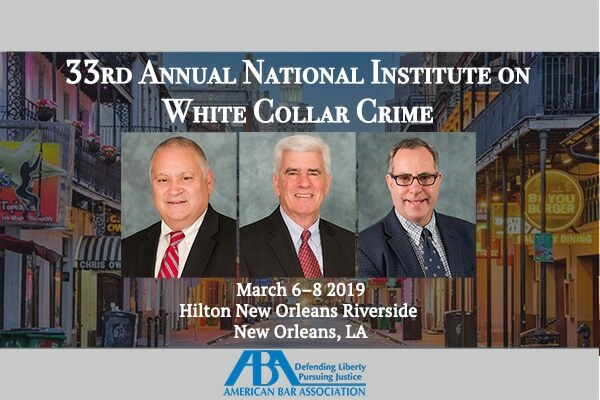 Affiliated Monitors, Inc. will be one of the sponsors of the 2019 White Collar Crime National Institute which will take place from Wednesday, March 6 to Friday, March 8, 2019, in New Orleans, Louisiana. Last year, attendance exceeded 1,000 at this annual gathering of the national white collar bar. The institute proudly continues to present outstanding panelists who deal with some of the most significant issues of our time. 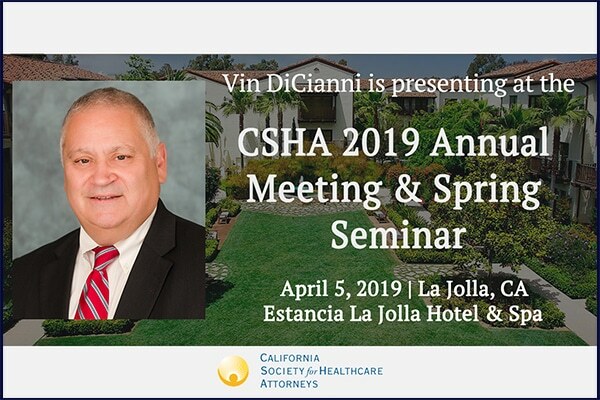 This institute has been attended by leading federal and state judges and prosecutors, law enforcement officials, defense attorneys, corporate in-house counsel, and members of the academic community. The faculty regularly includes some of the top members of the white collar bar in the United States and abroad. Among the audience are nationally renowned lawyers, as well as many who are beginning to concentrate in the white collar area. 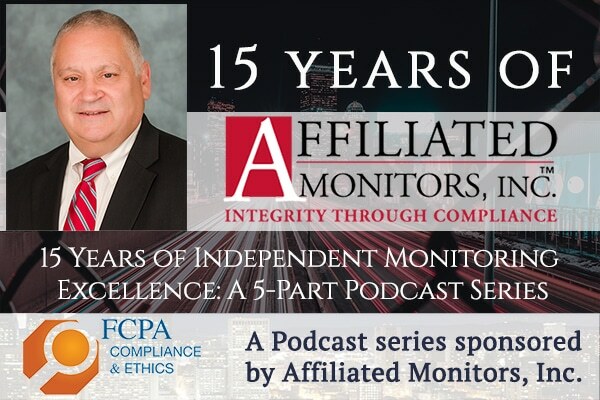 In this five-part series of sponsored podcasts, Tom Fox and Vin DiCianni sit down as a retrospective of the Affiliated Monitors’ first 15 years. AMI has been at the forefront of not only the use of independent monitors but also the dramatic growth of the compliance and ethics profession over the past 15 years. 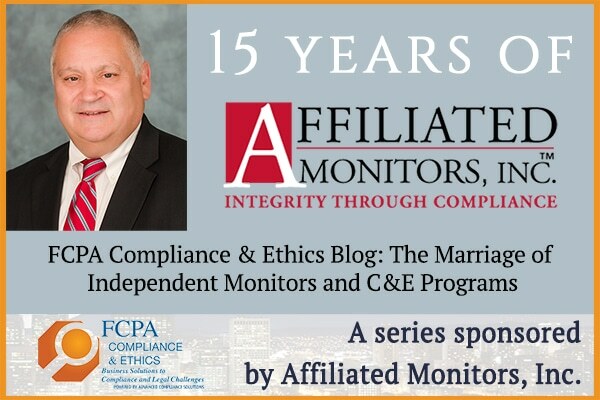 This is a history of both the rise of independent monitors as well as the government’s embrace of corporate compliance and ethics programs.In this concluding Episode 5, DiCianni reflects on where AMI has been, where it may be going and what he is most proud of on the occasion of the 15th anniversary of the founding of AMI. 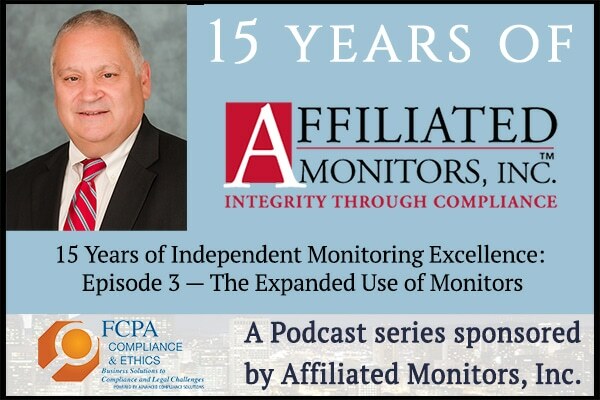 In this five-part series of sponsored podcasts, Tom Fox and Vin DiCianni sit down as a retrospective of the Affiliated Monitors’ first 15 years. AMI has been at the forefront of not only the use of independent monitors but also the dramatic growth of the compliance and ethics profession over the past 15 years. This is a history of both the rise of independent monitors as well as the government’s embrace of corporate compliance and ethics programs. In this Episode 4, DiCianni speaks on the marriage of independent monitors and compliance and ethics programs. 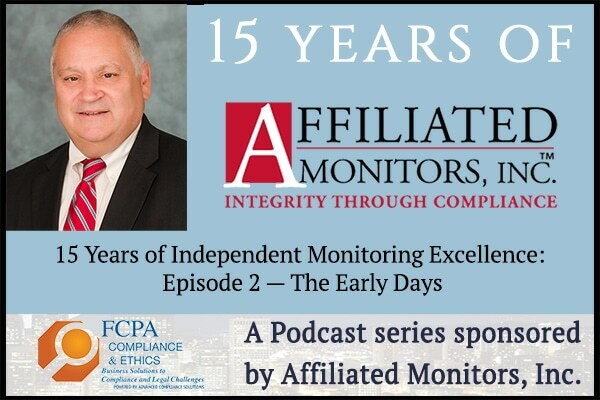 In this five-part series of sponsored podcasts, Tom Fox and Vin DiCianni sit down as a retrospective of the Affiliated Monitors’ first 15 years. AMI has been at the forefront of not only the use of independent monitors but also the dramatic growth of the compliance and ethics profession over the past 15 years. This is a history of both the rise of independent monitors as well as the government’s embrace of corporate compliance and ethics programs. During this episode, DiCianni discusses how the use of independent monitors has expanded. 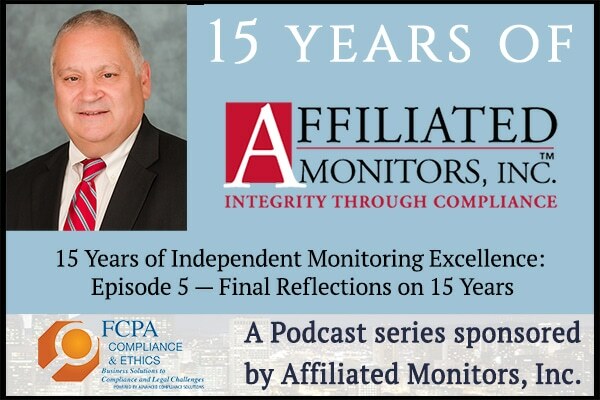 In this five-part series of sponsored podcasts, Tom Fox and Vin DiCianni sit down as a retrospective of the Affiliated Monitors’ first 15 years. AMI has been at the forefront of not only the use of independent monitors but also the dramatic growth of the compliance and ethics profession over the past 15 years. This is a history of both the rise of independent monitors as well as the government’s embrace of corporate compliance and ethics programs. In Episode 2, they discuss the early days of AMI. This year is the 15thanniversary of Affiliated Monitors, Inc. This week Tom Fox is running a five-part podcast series on the history of AMI and the history of the rise of independent monitors as well as the government’s embrace of corporate compliance and ethics programs. The idea for a business centered around the role of an independent monitor was developed by AMI founder Vincent DiCianni, and his response to a need he saw in this field. One of the more interesting aspects of this journey has been the marriage of independent monitors and compliance and ethics programs, largely driven by the Department of Justice (DOJ) and other regulators.